Any Palestinian state established absent a peace agreement with Israel will be a hotbed of terrorism. 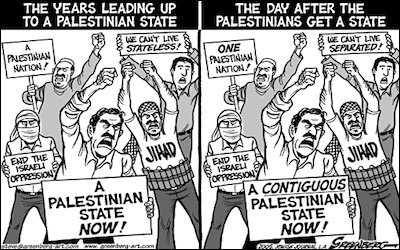 Congress should make clear it will sanction a unilaterally declared Palestinian state. Second, Congress should make clear its intention to immediately and completely cut hundreds of millions of dollars in annual U.S. direct aid to the Palestinian Authority (PA) in the event that President Mahmoud Abbas succeeds in his bid to win Palestinian statehood recognition at the UN. Congress reduced this aid by 22 percent last year in retaliation for the PA's continuing terrorism incitement. It would be a significant blow to a new state to cut all such aid. 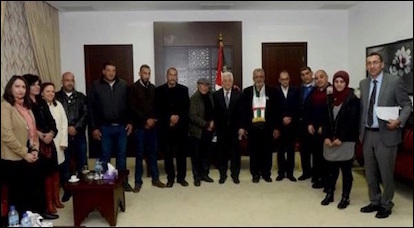 PA President Mahmoud Abbas meets with relatives of Palestinian "martyrs" against Israel in a photo published by the official PA daily Al-Hayat Al-Jadida, March 2, 2016. Now would be a good time for Congress to stop shirking its duty to shape foreign policy.